Character. Cost: 2. STR: 4. 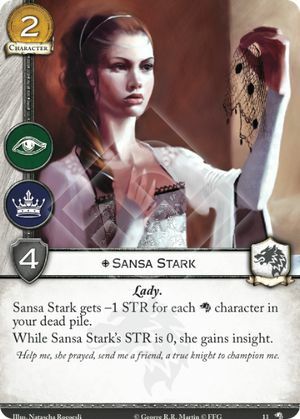 Sansa Stark gets -1 STR for each character in your dead pile. While Sansa Stark's STR is 0, she gains insight. Help me, she prayed, send me a friend, a true knight to champion me. Wolves of the North #13.